In the spirit of Thanksgiving, we’re grateful to Foothills Farmers Market – nestled snuggly in the knolls of Shelby, North Carolina – for graciously serving up our next helping of Instagram vittles! Market Manager, Angie Smith, gave us the scoop on how Foothills FM is a local cornucopia of health and prosperity. Farmers Market Coalition: What’s the story on Foothills Farmers Market? Angie Smith: Foothills Farmers Market was founded in 2008, beginning on the historic Courthouse Square in Uptown Shelby, NC. Our market is located in an urban area within the city limits, however the county as a whole is very rural. Foothills FM operates in three locations in Cleveland County, North Carolina. Two of the locations are summer markets and our Uptown Shelby location is every Wednesday and Saturday, April – November. We plan our winter market for the second Saturday of every month. Saturday mornings at market are always bustling with positive energy! The relocation of our Uptown Shelby Market to its new home in the City Pavilion was a tremendous success! This new location has allowed us to coordinate many activities and school and organizational field trip to the market. We are a grower certified market, which mean every product sold at Foothills is grown or produced within a 50 mile radius of our market. We have over 80 approved vendors and employ a Market Manager and Outreach Coordinator. The market is also guided by a Board of Directors. FMC: How does Foothills FM standout as a valued community venue? AS: We proudly accept Debit/SNAP/EBT and have a wonderful matching program called Market Moola. Customers earn Market Moola depending on how much they swipe. We run our Farmer Foodshare donation station every Saturday, a donation program for organizations that distribute farm-fresh food to communities in need. We engage the community by offering various events such as our annual Opening Day Event, Summer Kick-Off (including local food art, writing contest, teacher appreciation door prize, and planting station), National Farmers Market Week activities and market photo contest, a free Community Meal and extended community outreach to our most vulnerable residents. Market trips are coordinated for various community groups, such as the Boys & Girls Club and local schools. In addition to our special events, we rotate various activities like cooking demos, produce sampling, live music, and kids activities (pumpkin painting, planting, and bubbles). In 2016, we will implement the Power of Produce Club (POP Club), an interactive learning program for kids that includes fun activities and food demos, encouraging a healthy lifestyle. FMC: How do you use social media and other marketing methods to promote Foothills FM? AS: We use Instagram, Facebook, Twitter, and Pinterest. I post to Facebook and Twitter every Market Day and often post other relevant information on non-market days. I also send out a weekly newsletter using Constant Contact. Facebook has yielded the best results so far and we ofter have customers tells us that they saw something in a picture that they want or that the post reminded them it was Market Day – so never underestimate the power of a simple post! I’m inspired by other market’s social media posts and newsletters because they give me ideas for activities and other interesting/educational information to share with our customers. FMC: What are you most excited to share with our Instagram followers? AS: I really want others to see what a small town market in the rural foothills of North Carolina is capable of. The community support for our market continues to grow and every year we have more vendors and more customer shopping at the market. We hope everyone can see that we value family farms, endorse sustainable food production practices and innovation, contribute to the health and prosperity of the local community, and support the creation of a robust local food economy! 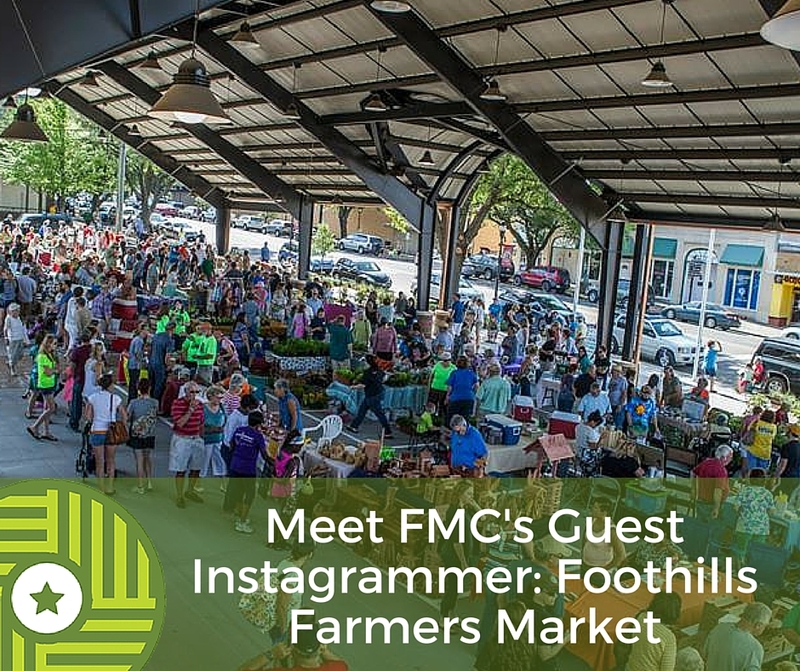 Learn more about Foothills FM by following FMC on Instagram!